So he is his parent’s joy. It turns out that the Oslo lunch was a mid-twentieth century phenomenon – designed by Norwegian Professor Schiotz in the 1930s, trialled in London 1938 and slightly later in Melbourne in 1941. 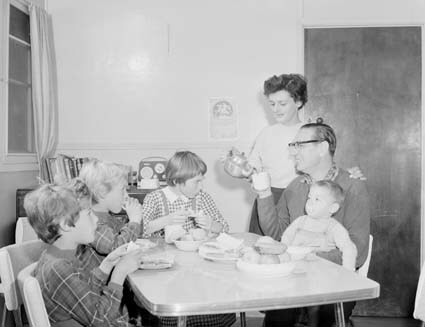 Nutrition conscious housewives, constrained by rationing, were encouraged to give their families an Oslo lunch – in other words, a cheese and salad wholemeal sandwich, accompanied by fruit and a drink of milk. It’s fair to say that cheese manufacturer Kraft saw the Olso Lunch as a rather wonderful marketing opportunity. That fat she will not stay. Dulce’s submission is confusing. Is it really a booklet of children’s poems as she claims in the accompanying form? As a mother, I can’t really envisage reading my kids poems about Oslo Lunches. I think further hints can be found in the text next to poems. Under one poem titled ‘Brother Bob’ she has typed ‘I have always eaten ‘Kraft’ Cheese, when previously on the market. My Mother and husband… would not allow anything else in the house… that’s a fact’. My guess is that she’s written this pitch for Kraft as an idea for advertising on radio, and at the same time applied for copyright on her work, so that Kraft couldn’t steal her creative ideas. She submitted a few things for copyright over the years – mostly songs, Her most creative year was towards the end of the war in 1944, when she submitted the following songs: ‘Hail to America’, ‘Tribute (to the American dead)’, ‘Eleanor (America’s First Lady)’, ‘Our Gracious Queen’, ‘In the Hush of the Evening’, ‘The Street of Forgotten Men’, ‘Marching Feet’ and finally, ‘The Women of Britain’. Her obvious bias toward America is interesting – given that she lived in Brisbane during WWII. She can’t have had any lingering ill feelings from the 1942 Battle of Brisbane. It would be interesting to know where, and to whom, these songs were ever sung. She does mention in her Olso Lunch copyright application that she worked in war effort entertaining. She’d look better, that I’m sure. This entry was posted in 1940s, copyight collection, National Archives, nutrition, Queensland and tagged Dulce Burns, food, Kraft cheese, Olso lunch. Bookmark the permalink. The significance of the Oslo lunch is that it was part of an overall nutritional education program for working-class people, so many of whom, to put it bluntly, ate crap. This was partly because they could not afford to eat better, but chiefly because of sheer ignorance about dietary matters. For working-class people, it had long been a challenge just to get enough to eat, never mind a healthy choice of food. Even in the 1950s, when I was in primary school, we were taught about the ‘Three Food Groups’, as though our mothers were too oblivious of such matters to feed us properly. Our school had a canteen, where sandwiches and rolls were prepared by volunteer mothers for sale to we pupils. We wrote our name, class, and choice of sandwich filling on a brown paper bag, or our mother did so for us, enclosed the cash, handed it over tge canteen counter before lessons commenced, and our lunch was delivered to our classroom in a large, shallow wooden box. There were no ‘snack’ foods offered for sale, nor soft drinks. The idea was to raise funds for the school, and encourage healthy eating in children.